Here’s the start of Desperate to Be a Housewife. The captain was still speaking when the plane went into a vertical dive. We were several miles above Kabul and had been making a gradual descent through clouds when a gruff Russian voice crackled through the intercom. We would have to corkscrew in, he said, because Afghan guerrillas on the ground armed with Stingers – “supplied by the Americans” – would most likely try to shoot us down. Whoa! Down we pitched. Everyone aboard was whooping, roaring, laughing, gasping. How many whiskies had we tossed back during the flight? It was a planeload of journalists en route from Moscow to cover a war, but no one had prepared us for this. Out the window bright lights shot through the sky beneath the fuselage. Not to worry, the pilot said. Our plane was firing off flares to try to deflect the heat-seeking Stingers. Not to worry? Those Stingers had proved remarkably effective in the Mujahedin’s war against the Soviet occupiers of Afghanistan and their puppet government in Kabul. Our Tupolev jet was a perfect hot target. Heart pounding, mouth dry, eyes fixed on the fireworks below the wing, I clung to the man beside me, a seasoned road warrior from the Times of London, who had gone pale. Down, down we spiraled. It was May 1987, and our Ariana Afghan Airlines plane had been chartered by the Soviet Foreign Ministry to take Moscow’s international press corps on a Kremlin-sponsored tour of the war. The ultimate irony, I thought, gripping the armrest with my free hand. Here we were, a planeful of Western hacks – British, French, German, Italian and, like me, American – facing possible instant death thanks to the generosity of the U.S. government in arming the Afghan rebels. Our descent would last no more than a few minutes but it was time enough for me to wonder what had brought me to this pass. I remembered my father and his best friend, Al, telling me and my brother bedtime stories when we were kids back in Wisconsin. These stories usually starred Tom Sawyer and Huckleberry Finn. My dad would conjure up an impossible situation – the two boys in a barrel about to go over Niagara Falls, say, or caught by a tribeful of Indians ready to scalp them – and just when it seemed there was no way out, he’d say, “Take it, Al.” By some miraculous sleight of word, aided by dry martinis, those boys always managed to escape. Was this childhood ritual responsible for my reckless confidence that all would be well in the end? That instead of settling down I could go off to Paris, become a reporter, move to Moscow and ultimately board the plane of an airline no one had heard of, to be fired at by Stingers and live to tell the tale? Thoughts cartwheeled crazily through my mind as we hurtled downwards. How did I, Mona Venture, come to be on that plane? I, Mona Venture, born in Manhattan, raised near Lake Michigan, where no one could have foreseen such a moment, least of all me? Well, a lot of time had passed since then. Now I was 37, and this was far from my first brush with potential calamity. Yet whatever came my way, from bliss to disaster, I was never really out there for the thrills. No, that was not what I’d been looking for. It was something quite different. Something that would have astounded those closest to me. I may have been seen as a graduate of the ready-for-anything school, but that was only part of the picture. 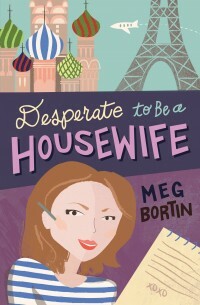 In my heart of hearts – and I have trouble even writing these words, so far are they from my public persona – during all those years, no matter what anyone else may say, I was actually … desperate to be a housewife. Very intriguing beginning to your memoir, Meg. I have been forwarded this portion by Trish Rehfield-Fink and am very impressed! Did you study French in America? Did you ever dream you would entertain such a life in a foreign country? Unbelievable!